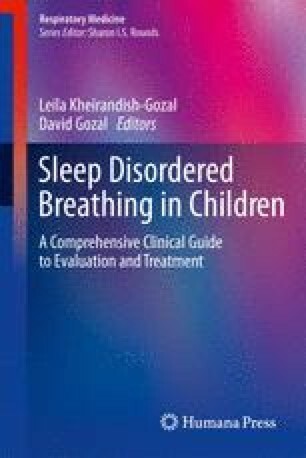 Laboratory polysomnography (PSG) is considered the “gold standard” for diagnosis of obstructive sleep apnea (OSAS) both in adults and children; however, it is expensive and time consuming. Since history and physical examination are poor at predicting OSAS in children, other abbreviated or screening techniques could be helpful. Most studies have shown that diagnostic techniques, such as videotaping, nocturnal pulse oximetry, and daytime nap PSG, tend to be helpful if the results are positive but have a poor predictive value if results are negative. Thus, children with negative results in abbreviated or portable recordings should undergo a more comprehensive evaluation, such as overnight PSG. Further investigations must be conducted to test the suitability of these simplified monitoring in order to verify their cost efficacy. The more promising technique seems to be the unattended ambulatory 4- to 6-channel recording equipments that might assess the severity of OSAS, which is useful for determining treatment and follow-up.